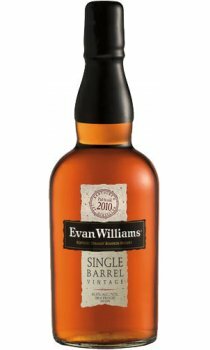 Evan Williams is the only vintage dated Single Barrel Bourbon on the market. Each year the Master Distiller selects barrels that meet his exacting standards. The vintage on the label is the year of distillation, and in addition to this, hand written on each bottle is the date the whiskey was put into oak, along with the date it was bottled and the exact serial number of the single barrel that the Bourbon was drawn from. Each barrel serial number will have its own personality and flavour nuances. Evan Williams Single Barrel is made at and marketed by Heaven Hill Distilleries, who were founded after the repeal of prohibition in 1934 by the Shapira brothers when they were approached by members of the famous Beam family with a proposal to build a new distillery. To this day, Heaven Hill is owned and operated by the Shapira family and has Parker and Craig Beam, the 6th and 7th generation of the Beam family, in charge of whiskeymaking. This is the secret behind the quality and consistency of whiskies at Heaven Hill, which always offer fantastic value for money! Massive Christmas-Cake aromas immediately after opening, brilliant. Wait 'til there's mates round before opening and pouring those first measures. After that it mellows, with a surprisingly high corn-like taste, mixed with vanillas and smoke. Very nice but at this price for a bourbon, I would consider others. But at this price for a Single Barrel you cannot argue. When it arrived, I was amused to see that this bottle was taken from the cask the day after my birthday (almost a nice coincidence), if I order again when this bottle's empty, who knows... And that's the beauty of Single Barrel Vintages. I've certainly tasted enough in this one to consider buying another bottle of this well-priced single barrel beauty. I love Bourbon and this single barrel does not disappoint. Perfect on the rocks (as it should be) and rivals any other bourbon I've tried. Evan Williams is well worth a try.